In the second of our Halloween horror podcasts, we look at The Wicker Man: The Final Cut , a newly restored version of the classic 1973 British film. We’ve slightly bent the rules this time around – usually we only review films that either one or both of us hasn’t seen before, but we’ve actually both seen The Wicker Man – several times in fact. However, this is a brand new version of the movie – The Final Cut – in which the whole film has been restored from a new-found print and director Robin Hardy has chopped out some scenes and inserted others. So neither of us had seen this version of the film before, which means we can include it on the list. Hey, don’t give us that look, it’s our podcast, we can do what we like! Anyway, Ian was lucky enough to see this at a screening a couple of months back, and I managed to get tickets for the premiere at the British Film Institute, which was a brilliant evening for a number of reasons. Mostly because Robin Hardy was there doing a Q&A after the film, and he very nearly rivalled the late, great Michael Winner in terms of anecdotes and bon mots, but also because of a certain incident in the foyer just before I went in. I won’t spoil it for you – just listen to the podcast. To be honest, we both struggled a bit to work out what parts had been changed in the film compared to the ‘Director’s Cut’ version a few years back. The most obvious change was the removal of the scenes with Sergeant Howie on the mainland at the beginning, which Robin Hardy notes were superfluous, and I tend to agree with him. I’m fairly sure that Britt Ekland’s famous dance routine has been pushed back to the second night in the film as well, and we also get to see some copulating snails, for what it’s worth. Most importantly though, this new version of the film looks fantastic – a vast improvement over the previous one, which was patched together from various prints and VHS copies. If you’ve never seen The Wicker Man, you’re in for a treat. It’s a bizarre, enticing film that draws you in with its weird, sometimes funny depiction of life on a remote Scottish island before knocking you down with a sensational ending. Famously, it’s almost impossible to categorise: perhaps the closest you could get is a comedy-musical whodunnit with a hint of horror. Whatever it is, it’s unmissable. The Wicker Man: The Final Cut is in cinemas now and is released on Blu-ray on 14th October – you can buy the Blu-ray from Amazon by clicking here (and we get a little bit of cash if you do – thanks in advance). Last but not least, our Secret Sponsor for this week is Careless Whispers Podcast. They are on Twitter but they, um, haven’t actually tweeted yet so I suggest you take a look at their Facebook page. 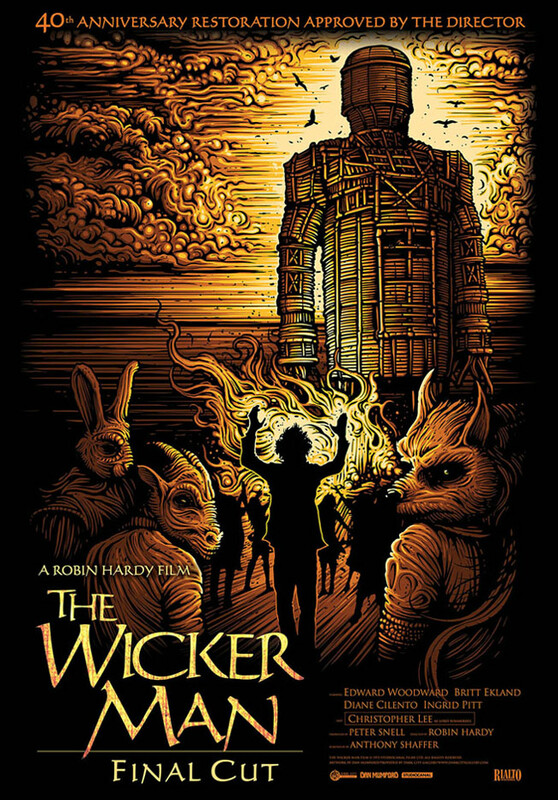 Pingback: Movie Idea: The Wicker Man | The 24-Hour Movie Marathon Weblog!